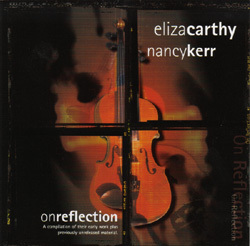 Eliza Carthy/Nancy Kerr "On Reflection"
Gadfly Records is proud to release "On Reflection," a compilation of early work and previously unreleased material from one of folk's brightest new performers -- Eliza Carthy -- and her former partner Nancy Kerr. A unique and engaging artist with an impeccable pedigree, Eliza Carthy has recently taken the contemporary music world by storm, with her "Red Rice" Topic recording and, just last year, her Warner Bros. release "Angels and Cigarettes." But her earliest recordings, "Eliza Carthy and Nancy Kerr" (1993) and "Shape of Scrape" (1995) -- when she was recording with fellow fiddler/vocalist Nancy Kerr -- are amazing glimpses into the talent and pizzazz of Carthy (*and* Kerr) well before she burst onto the contemporary folk scene. "On Reflection" culls tracks from both of the above-named albums and also includes two Nancy Kerr tracks from her Fellside albums and three unreleased tracks from Carthy and Kerr.